The haiku, when it works, makes us suddenly aware of our own awareness. The flow of ordinary experience stops for a wonderful moment; we are arrested by our own surprising ability to reflect on our experience at the very moment of our having it. The dream, when it works on us (that is, when we let it work on us) does exactly the same thing. We are surprised; we are brought up short; we are in a state of momentary confusion as we puzzle about what we were doing in that enormous mansion, why that dog was following us, why we can’t get to the right classroom. All this oddness brings us up short, and with good reason. Professor Kirschner’s book is a testament to that "good reason." In his Introduction to Joseph Kirschner’s book Inside Out, Daniel Lindley of the C.G. Jung Institute of Chicago calls it "a celebration of living." It is also—like the featured Jungian theory of synchronicity ("meaningful coincidence")—a call for balance (inner-outer) and harmony. Kirschner’s many examples of haiku based upon dreams reveal, as did Jung, that the archetypal elements in the collective unconscious represented by dreams may prove more creatively productive and universally relevant than the purely rational. Dreams are a guide to an integrated self and thus an antidote to ego-centered expression. Altogether, this is a book rich in valuable insight, especially revealing of that shared world—of "twists, turns, surprises, and mysteries"—that dreams and haiku have in common. Joseph Kirschner. 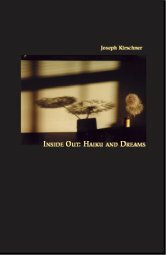 Inside Out: Haiku and Dreams (Evanston, Ill.: Deep North Press, 2003). 88 pages; 5.25´´ x 8´´; perfectbound. ISBN 1-929116-10-1. $20.00 postpaid in the United States from the author at 2157 Ridge Ave, 2D, Evanston IL 60201.